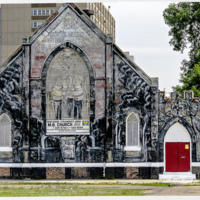 Location contains "Chicago, Illinois "
In 1972, a pioneer of the Chicago mural movement, William Walker, painted a mural on Strangers Home Missionary Baptist Church that was both a rallying call for social justice and a symbol of love and unity. 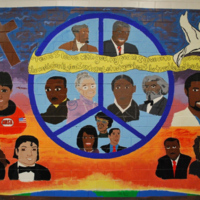 Painted in an era of social revolution, and radical in its day, the inclusionary mural incorporated the names of individuals such as Jesus, Gandhi, Malcolm X, Martin Luther King Jr., and Anne Frank. 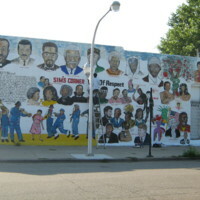 Further down the murals are the martyrs of the Civil Rights and Black Power movements – names such as Medgar Evers, Mrs. Liuzzo, Fred Hampton, Mark Clark and Emmett Till. 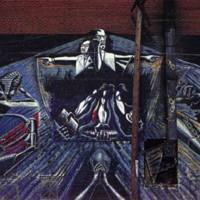 In December 2015, All of Mankind was suddenly destroyed. 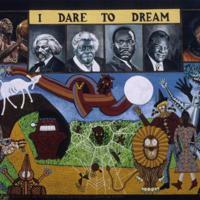 Jon Pounds, executive director of the Chicago Public Art Group (formerly known as the Chicago Mural Group), commented that the mural was a rare remnant of the civil rights era. 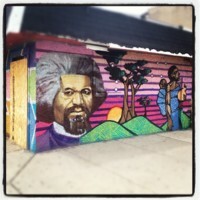 He knew it was under threat when the church went up for sale in 2011, but preservationists had tried to protect the mural. 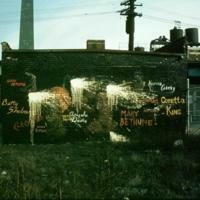 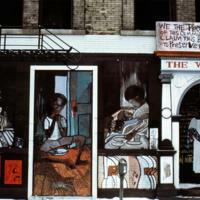 In 1970, John Pitman Weber of the Chicago Public Art Group created a mural on the wall of the Christopher Settlement House on the north side of Chicago. 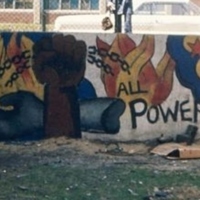 The mural faces a children’s playground in a predominantly white working-class area of the city and according to Weber, the neighbourhood’s anxiety regarding racial tensions in the community only emerged during the creation of the mural and related discussions with local residents. 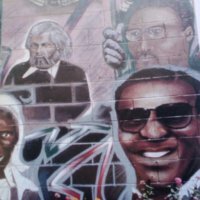 Working together, Weber and the local residents agreed that the racial concerns needed to be surfaced, and the mural would serve this purpose. 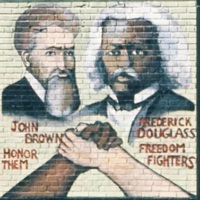 It depicts narrative scenes across the wall, including daggers and guns held by both black and white individuals, black hands in handcuffs under the phrase “free all political prisoners,” (something that the Black Panther Party was pushing for in the 1960s and 1970s), and a black hand shaking a white hand under the faces of Frederick Douglass and the radical white abolitionist John Brown, who are both identified on the mural as Freedom Fighters. 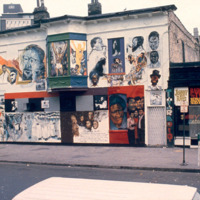 The mural had been destroyed by the late 20th century.